Road trips by car are dangerous for quilters and knitters. 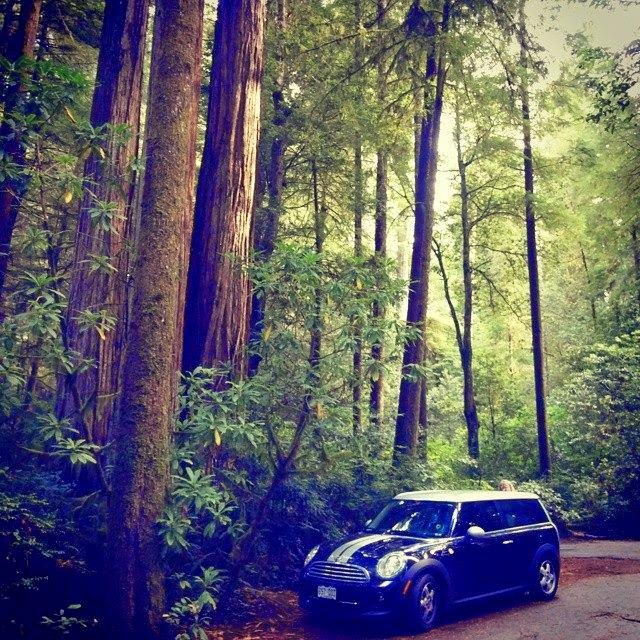 All that room to fill with purchases -- even in the Mini Cooper! Definitely a "bucket list" trip. So did I buy any fabric on this trip? Umm -- yep! Enough Cotton + Steel deco weight to make a Noodlehead Super Tote for me. 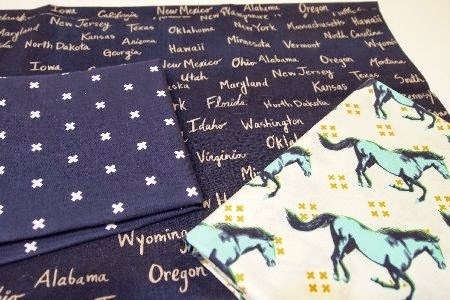 Some "beachy" cottons from Creative Fabrics in Wheeler, Oregon. These are to make a block for one of the members of the 2013 Scrap Squad. She wanted "anything that reminds you of the beach." 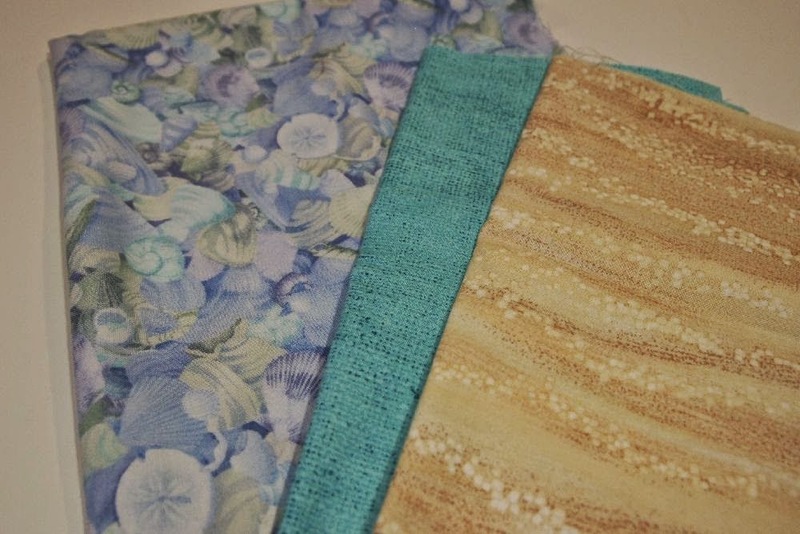 What's better than fabric from the beach? I love to visit the shops in Quilt Sampler's Shop Hop magazine. We "happened" to duck into Boersma's Sewing Center in McMinnville (the GPS really, really wanted us to drive I-5 from Portland to California!). This is quite the shop -- at least a half-dozen long-arms in their basement classroom and at least as much fabric as Ruth's Stitchery! Their project in the magazine is my favorite, so how lucky that this is the one shop I got to visit. 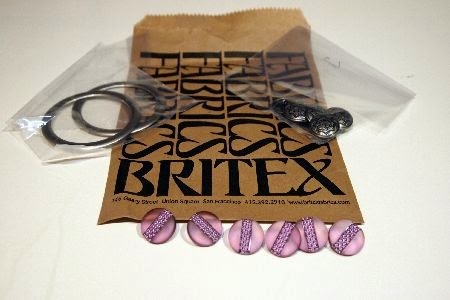 The one place I wanted to visit in San Francisco was Britex Fabrics. So after touring numerous historic ships and Fisherman's Wharf, My Little Sailor followed me to Britex. Wow. Just. Wow. I was so overwhelmed, the only thing I bought was buttons for two sweaters, and big metal rings for Friend Mary to use on our next Abbey Lane Beatle Bag. I missed one skein of yarn on Thursday's knitting post. 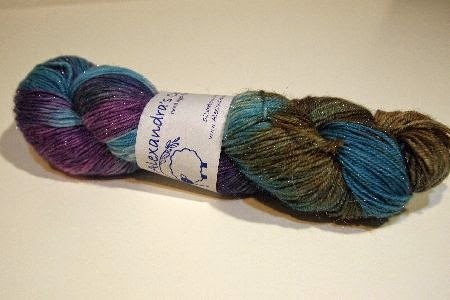 This lovely thing is from Tangled Yarns in Tillamook. As is the lovely matching shawl pin on the left. 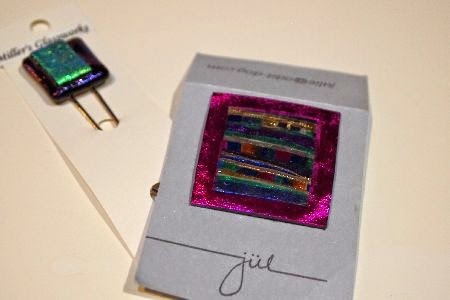 The Julie Ueland pin is from the Latimer Quilt & Textile Center. Years ago, when I worked at Pacific Lutheran University in Tacoma, Julie also lived in Tacoma. Each season she had a special sale of her jewelry. So I had to buy this just for old time's sake! 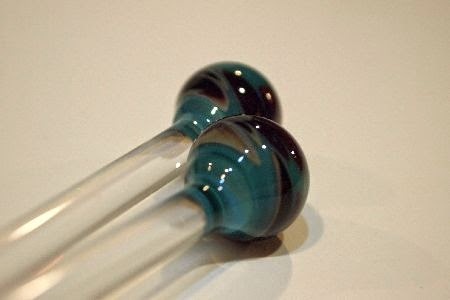 It's the ends of these glass knitting needles gifted to me by DD. Aren't they gorgeous? 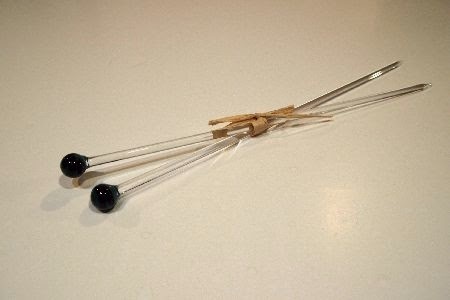 The "needles" are size 10, so I'll have to find some chunky yarn to knit a scarf using them. Last purchases from our trip are not fabric, nor yarn. 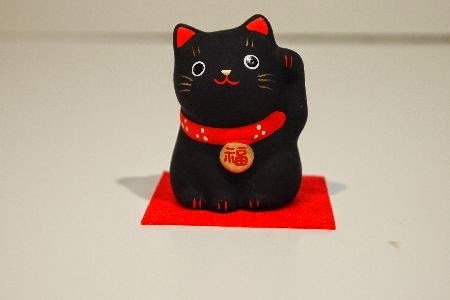 This Lucky Cat, or Maneki Neko, is black to protect family. Appropriate, as MLS returns to Japan tomorrow! As a reward for reading all the way through this long post, I have 8+ yards of batik fabric to offer you! The first person who comments on this post with your PayPal email address and zip code, gets the de-stash for the cost of postage. It will fit in a medium-size flat-rate box, so US postage will be $12.65. Think of me tomorrow as I make the early-morning trip to the airport to send My Little Sailor back to Japan for two more years! Great pics! Lots of goodies. Love the tall trees. 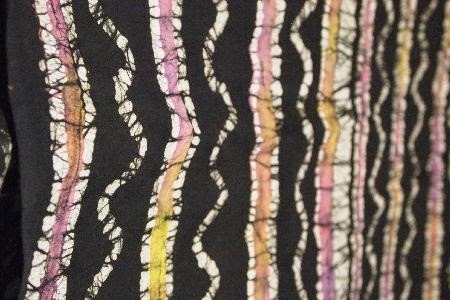 That batik fabric would look lovely sitting on my shelf and be the perfect backing for one of my projects. My PayPal email is my reply email. Zip code is 29560. Hope your son has a safe trip back to Japan. Lots of lovely fabric goodies there, I'd be too nervous to use the glass needles in case I dropped them or sat on them! Loved seeing all those goodies you found on your road trip. I went to McMinnville in 2011 but it was to the Evergreen Space and Aeronautical Museum...didn't realise there was a great quilt shop there! Lol. I spent an hour in Britex though...it was amazing. Talking of Oregon though, I found a lovely quilt shop in Pendleton...lovely owner! 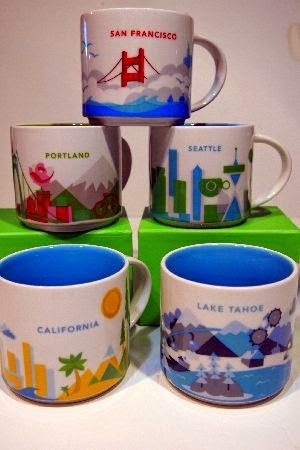 Oh I see a Portland cup. 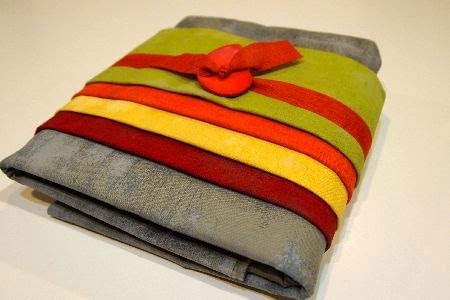 Did you stop at Fabric Depot? Lovely fabrics and yarn. It sounds like a great road trip.